Plot Summary: The movie or special begins with the history of the Transformers on earth utilising the clips from the Chou-Robot Semeitai Tatakae Transformers. The story begins with the Cybertrons on a secret mission constructing a gigantic Cybertron warrior which resembles a city, Metroplex (Scramble City). The Destrons sent spies to monitor them and later sends the Constructicons to wreak havoc. 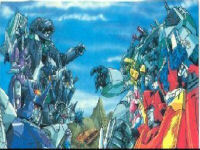 Convoy and the aerialbots defeats Devastator but later faces Menasor. Bruticus (Combatrons) arrive to battle and later joined by Defensor (Protectobots). The battle was later joined by Metroplex and ends with the shocking appearance of Dinosaurer (Tripticon in US). Originally meant to be an OAV series, Scramble City was created to take place between the second and third season of the original Transformers Series. This was meant to take the place of Transformers The Movie which didn't see a release in Japan until 1990. Unfortunately the first episode ended on a cliffhanger and a second episode was never released. However, there was an informal sequel created by Takara using stop motion footage of the actual toys. Scramble City is featured on Disc 1 of the Transformers: The Movie 20th Anniversary Special Edition DVD release. Due to licensing issues, the U.S. release has no audio; instead, it features commentary by two Transformers fans.